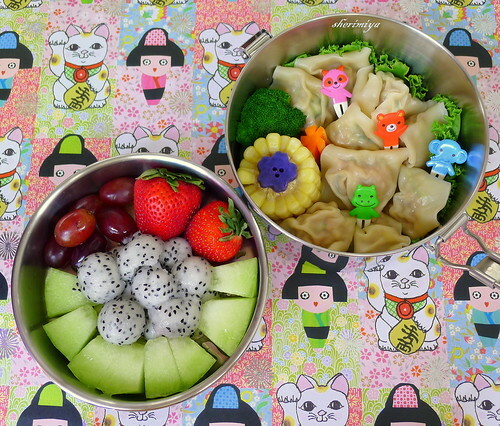 Wonton Dragonballs Bento, a photo by sherimiya ♥ on Flickr. Shared at What's For Lunch. yay..Wontons! my boy love those too! Yeah! I think everyone loves 'em! My kids would love to have wontons for lunch box (not this year, but next year.). I have one question... does it get dry up? Even you pour some sauce or soup, does it stay moist? Just curious if you do any tricks to keep it hydrated. Now I want to leave work early today to come home and make wontons! Lol! Nami, the wontons don't dry up. In fact, I'm more concerned about them getting too soggy; if I were to pack soup I'd keep the wontons separate. But since my kids like the wontons as is, I only have to pack them in a sealed bento box and they stay hydrated. By lunchtime they'll be at room temp, which is how my kids like them. Did you make them? Heh. Thanks Heather! I love the way you presented the fruit. Audrey and I must work on our presentation.